Do you need a gold trophy for your club or school event? Then look no further. Here at Aford Awards, we provide a wide range of top quality gold trophies suitable for all types of events. Achieving a gold award is the highlight of any event and the best possible award any individual or team player can win; therefore we strongly believe that all of our gold trophies should be of the highest quality with competitive value-for-money prices. Whether you wish to award an individual with a gold 3D figure gold trophy or a team with a gold cup trophy – we are sure that we have something suitable for your needs. Within our extensive range of gold trophies, you will find a whole host of sports from football trophies to motorsport, golf trophies, running trophies and running medals we have thought of it all. 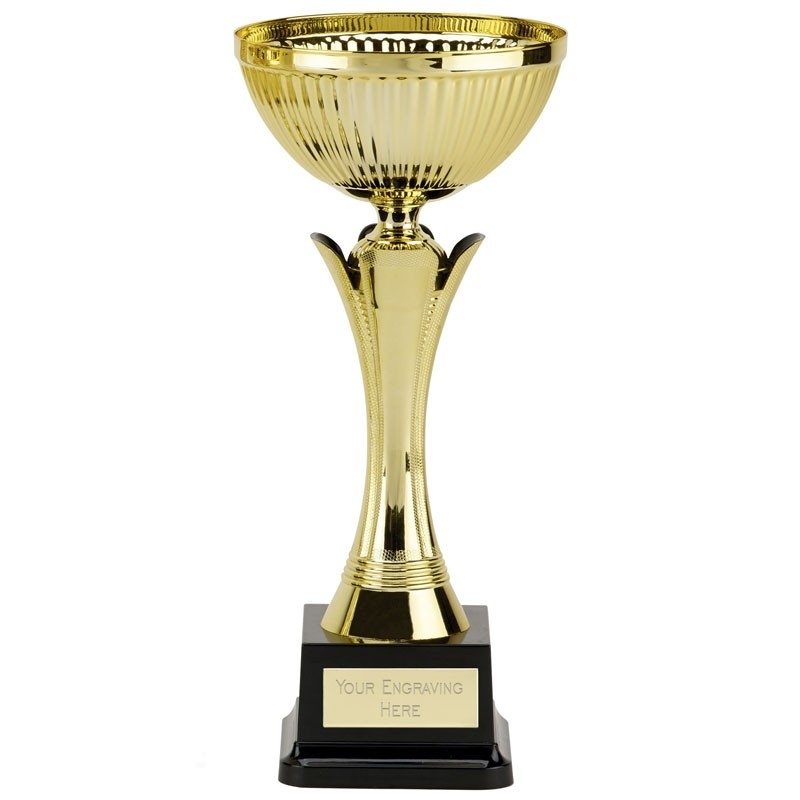 You can find our full range of sports trophies here. We are one of the leading trophy suppliers and engravers in the UK therefore if you can’t find what you are looking for, simply get in touch and we will do our very best to help you with your requirements. With every gold trophy purchased, we will personalise it for free with our free engraving service. Our exclusive free engraving service allows you to have up to 60 characters uniquely personalised on to the trophy to turn an everyday gold trophy into something that individuals can treasure for years to come. All you have to do is get creative with the character limitations and leave the hard work to us. We use state-of-the-art engraving machinery to gently personal just about any surface possible – we will even engrave products bought elsewhere with our premium engraving service available to all. We believe that our prices are the most competitive prices on the market. We are so confident that our high-quality gold trophies are at the best possible prices around, that we will even offer you a 5% discount should you find a better deal elsewhere. No we aren’t going mad. Our price promise means that you are guaranteed the best price on the market, something that we are very proud of at Aford Awards. Though our prices are competitive, we will never skimp on top quality materials. We promise that all of our gold trophies are produced using the finest materials to create high-quality awards that impress our clients time and time again. We’ve been supplying gold trophies for over 30 years and know all there is to know about the world of trophies, so if you have a burning question to ask feel free to give us a call on 01622 738711 to speak to a member of our team today. Alternatively, if you require something a little smaller than a trophy, take a look at our gold medals. All of our gold and silver medals are produced with the same high-quality materials that we use in all of our products and the free engraving service is still included using the same character limitation as the trophies – so get your thinking caps on and get creative! Our gold trophies received an average of 4.75 out of 5 based on 394 reviews.